For your wedding guests the table decorations are the ones they will have the most time to view so it is important to take time to think about how your table decorations will fit within your chosen theme and style AND within your BUDGET. There are a lot of companies out there who sell or hire everything you can possibly need to decorate your reception tables. Buying or hiring the full table detailing may not be the best idea for the couple getting married on a budget. As a person I would not be described as crafty by others nor by myself; however DIY reception table decorations are easily do-able by even the most inept crafter. Autumn is my favourite month. The colours of the turning trees and plants, the falling of the leaves, the fresh crisp mornings and the bounty of free beauties. 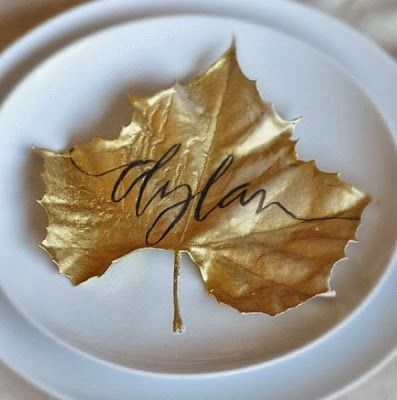 Leaves make perfect place names for your reception tables. I love the look of them sprayed gold with guests names hand written on to them in sharpie. When choosing your leaves it is best to take them early in the season on a dry day. If need be you could take them while they are still on the trees and even before they start to turn. 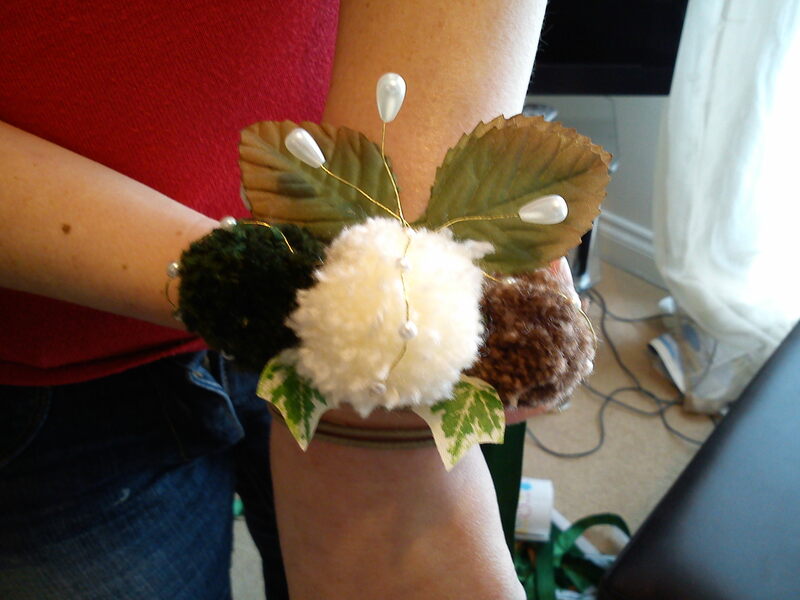 You could forgo the spraying and write place names on them as is for a more natural and earthy look. 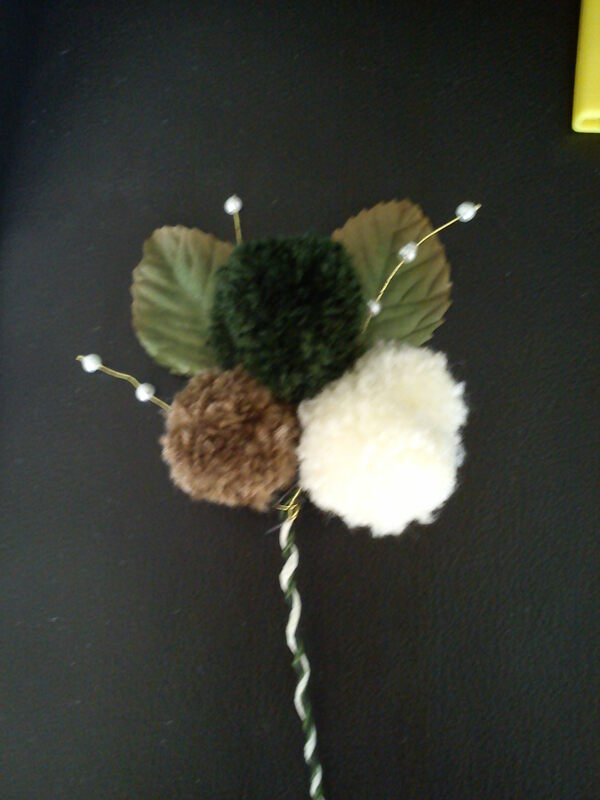 leaf shapes can even be attached to a natural favour such as an apple or pear for a spring wedding. Attach the leaf shape with the guests name written on it to the fruit of your choice with a pin or tooth pick. 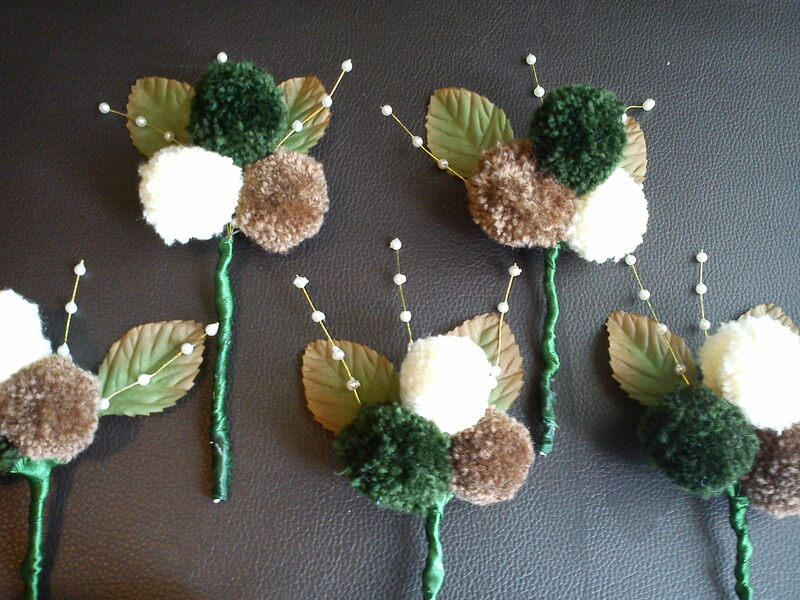 Other autumnal items to bring in to your wedding are pine cones, acorns and conkers. Fill the bottom of your jar with acorns, conkers or pinecones, stick in some small branches that still have leaves attached and then add your own touches. The examples here utilises gold bell strings and tiny battery operated fairy lights. 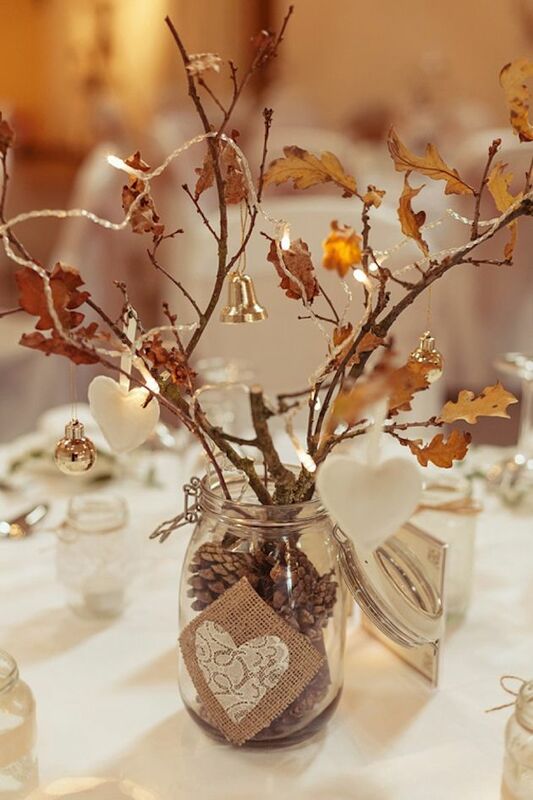 For a December wedding you could add fill the bottom on the jar with small tree decorations and stick in thin branches sprayed white or silver and hang Christmas decorations and fairy lights from the branches. The battery pack of the fairy lights could be hidden in the base of the jar to keep everything tidy. For a Spring or Summer wedding bring the outdoors in with rustic influences. 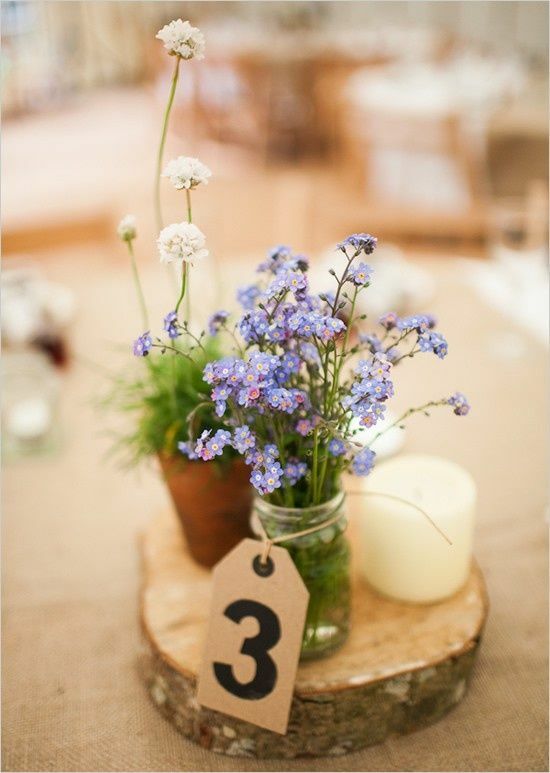 Team un-decorated glass jars and pots with wild flowers, short pillar candles and a narrow un-treated log circle. Keeping the center of gravity of your table decorations low enables better communication between the guests at each table; which will create a better atmosphere – what more could a bride want than a buzzing conversational and relaxed atmosphere on her wedding day. Babys Breath is BIG at the moment and simply stunning when teamed with simple jars, and works well for any wedding theme! 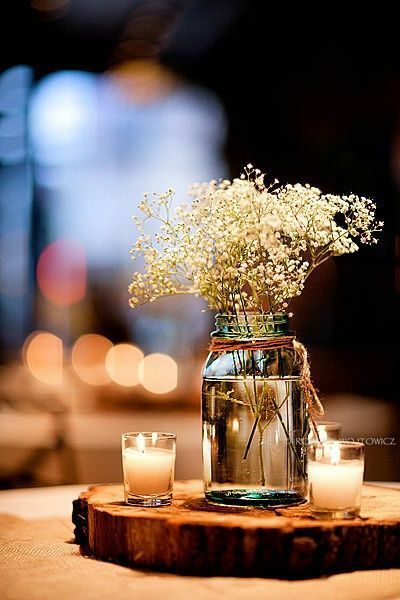 Go simple and rustic with babys breath or glitz things up by putting clumps in jars that have been customised with glitter or spray painted in the your wedding colour/s. I’m going to end this post with the elegance of spray painted bottles. The bottles need cost you nothing, just save up some wine bottles or even nice olive oil bottles, glass coke bottles or even glass water bottles. You can even ask friends and family to save some interesting shapes bottles for you. The variety of bottle shapes and heights only adds to the effect. Clean the bottles out thoroughly and spray paint them your chosen colour. I think metallic colours look amazing! Add glitz with bangles (the attached picture uses shower curtain rings! ), or wrap strings of “pearls” about the thin part of the neck. 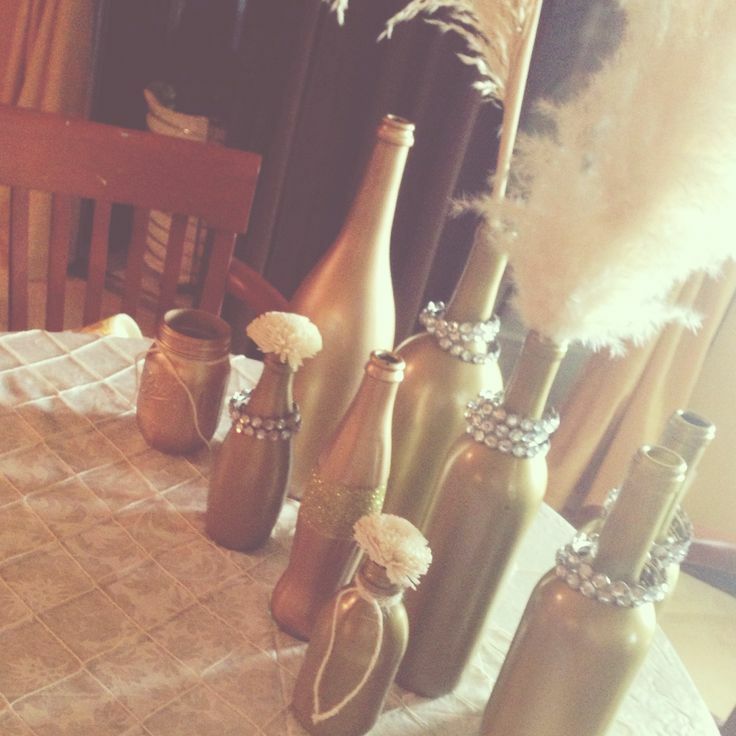 Put a mix of bottle shapes and heights on each table and stick flowers or feather in the top of the bottles to create height and interest. These bottles could be stood on mirror plates or complimented with table crystals. So there you have it; some interesting ways you can create budget table decorations that look anything but cheap! A friend of mine who is also a bride to be, getting married in November this year, and I went to a wedding fayre at a venue near us. The wedding fayre was my first ever fayre, and to be honest it wasn’t great. I’ve heard people talk about a lot better wedding fares; however I did get a really good idea! In the reception room at the evening they had tables laid out with flowers and stationary examples and the supplies of those flowers and stationary were also in the room. One table really stood out for me! 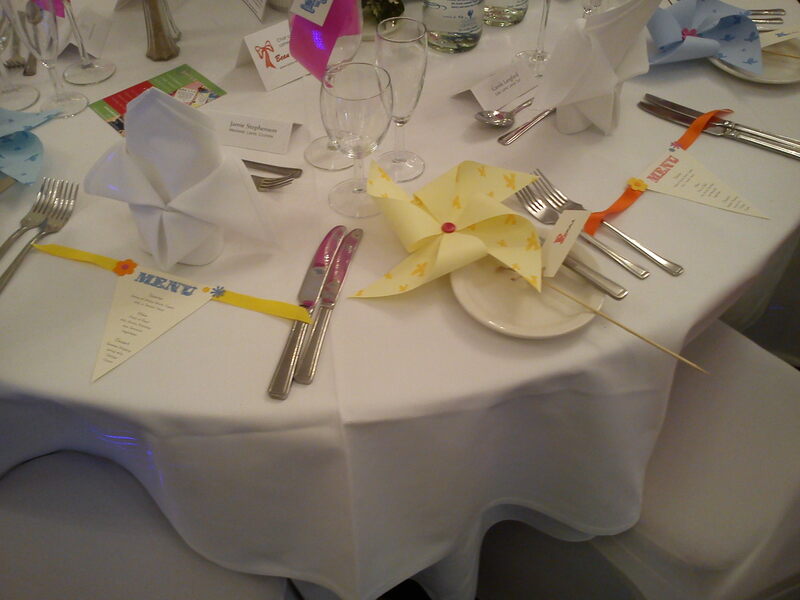 The colour theme of the table was Orange, Yellow and Blue – not exactly to my liking – but I loved the paper pinwheels and the bunting idea for the menu’s. 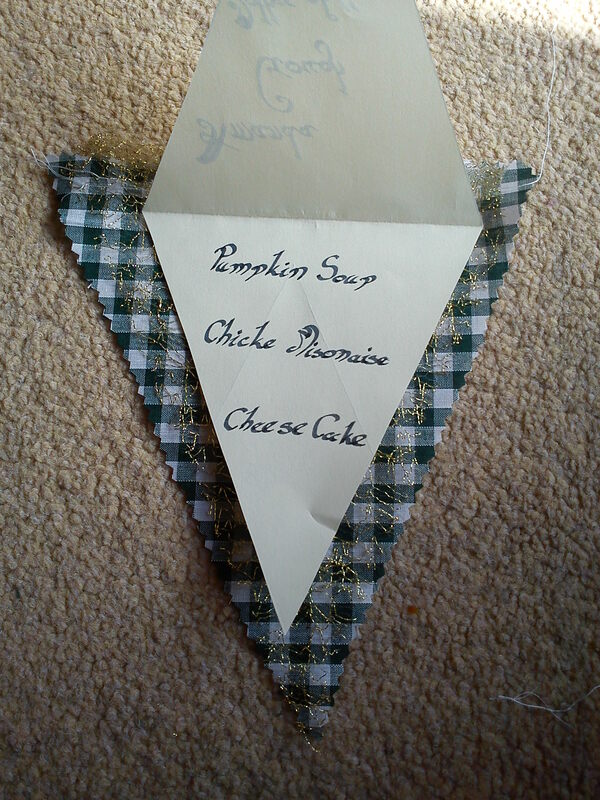 Here is a close up of one of the bunting menu’s on the table. 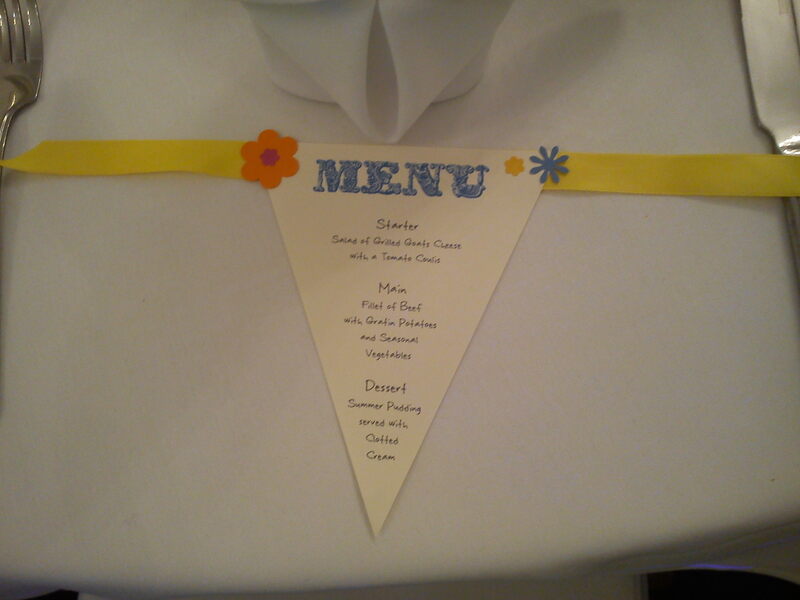 Although I loved the pinwheels, my budget wouldn’t really allow me to bring in yet another dimension to the wedding, but the bunting for the menu really inspired me! 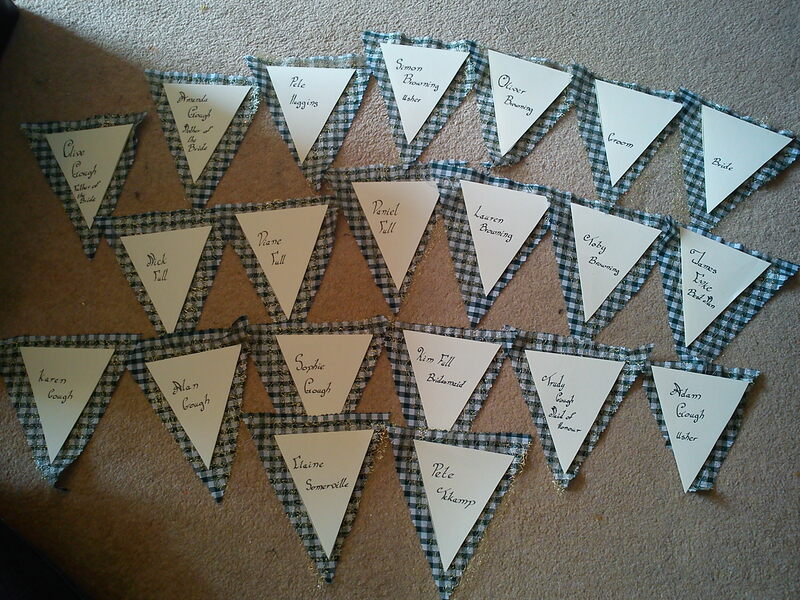 So while making the bunting as discussed in my previous post we decided to make some bunting for the menu and the place names. 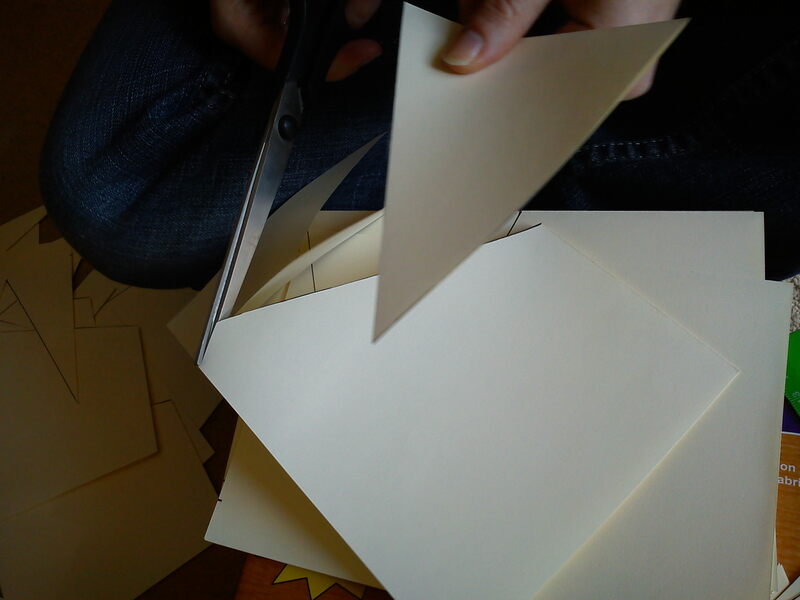 With your chosen card draw triangles onto the card to the designed size. 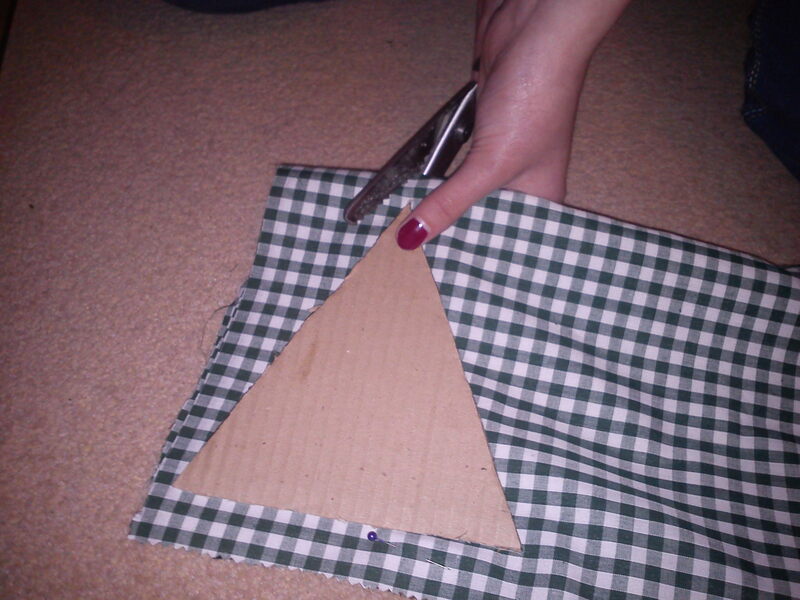 We chose to make our triangles a good size but still smaller than the fabric triangles. Then cut these out. We used A4 paper, folded the paper in half and drew the triangle going down from the folded side. This meant that we could write the place-name on the top side, and open up the triangle of card to write the menu on the inside. 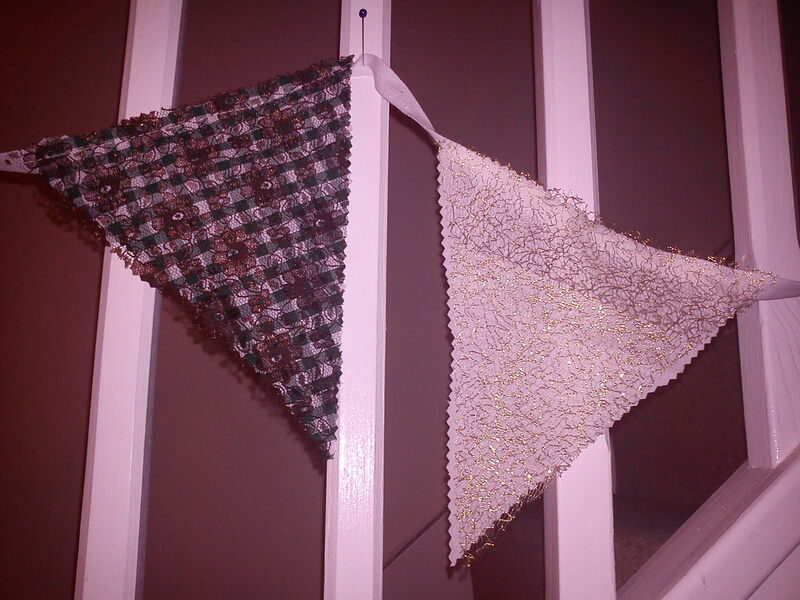 You will then want to sow the bunting triangles onto the bunting line. 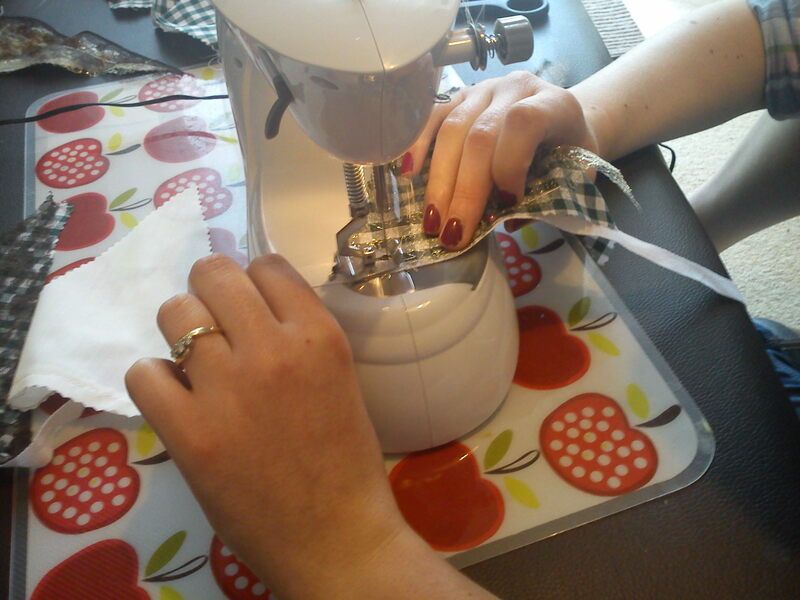 Which is quite easy especially if you have been sowing loads of bunting already. 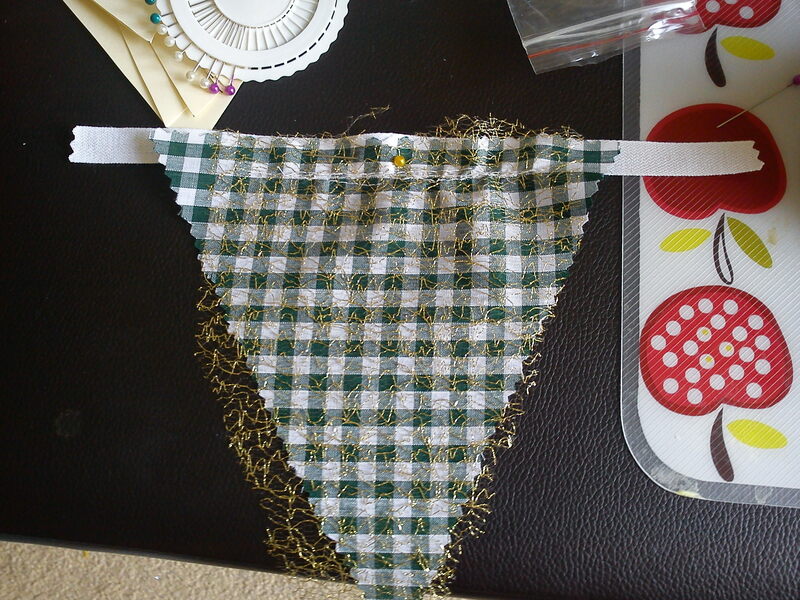 Simply pin the bunting triangle onto the bunting line and sow. Due to wedding guest list issues we haven’t got much further than this, and we do need to confirm the menu with the venue, however, once you’ve sown your bunting and written your menu and/or place settings onto your card attach your card to your bunting with craft glue. Here is a mock-up of the card part. This weekend my MOH and I got together for another weekend of wedding crafts. Some things that we want to get done, such as the Table Plan, Place Names and Menu’s etc can’t be done yet as the guest list is up in the air at the moment due to family issues relating to the afore-mentioned guest list. 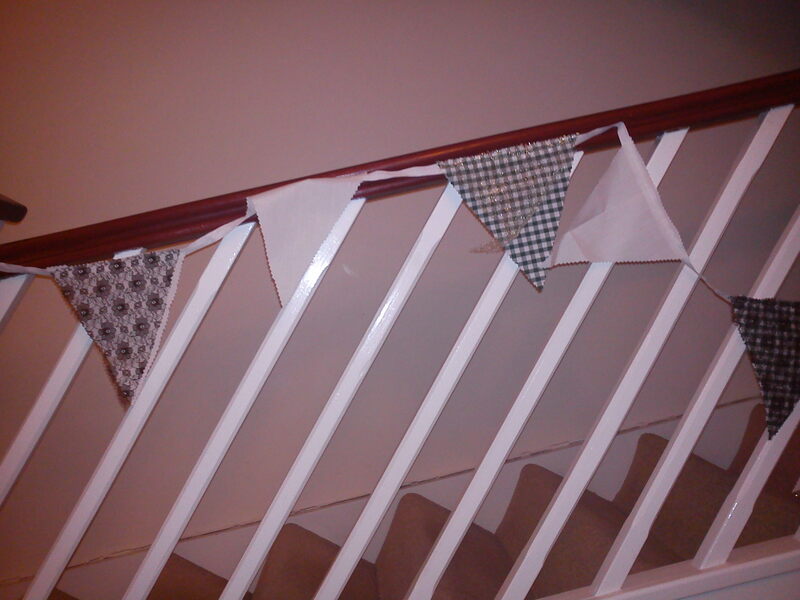 So we had to move onto the bunting. 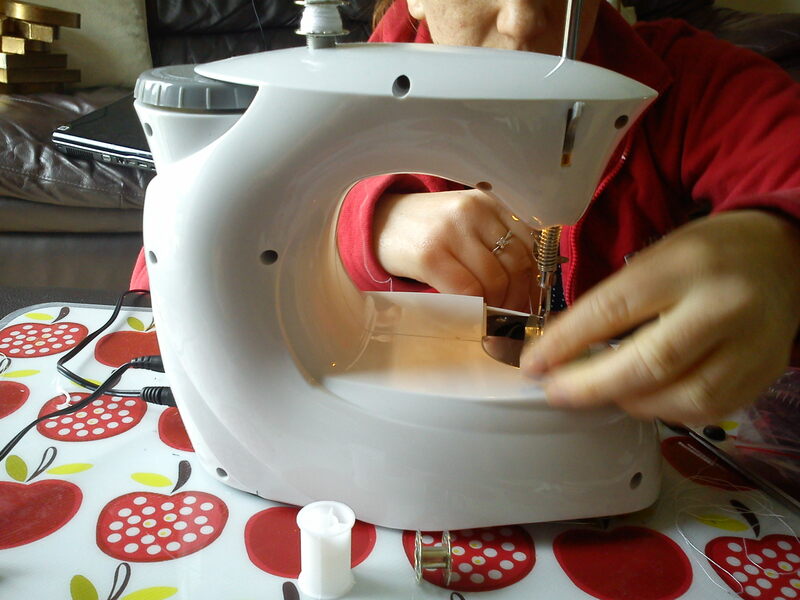 The hardest part of the whole process was getting to grips with the sowing machine; as neither of us had handled a sowing machine since GCSE Design and Technology class. 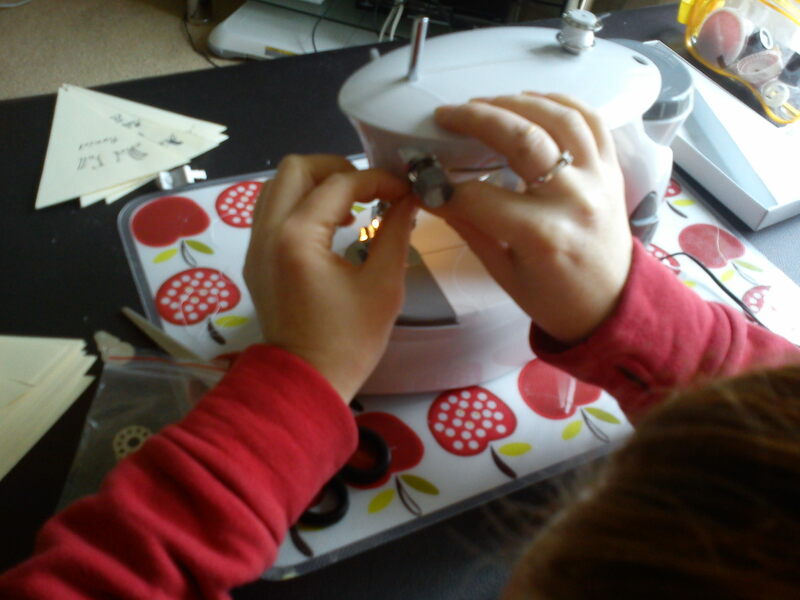 Here are some pictures of us trying to set the sowing machine up for you to giggle at. Now you’ve had a giggle at us, lets get down to the How To. 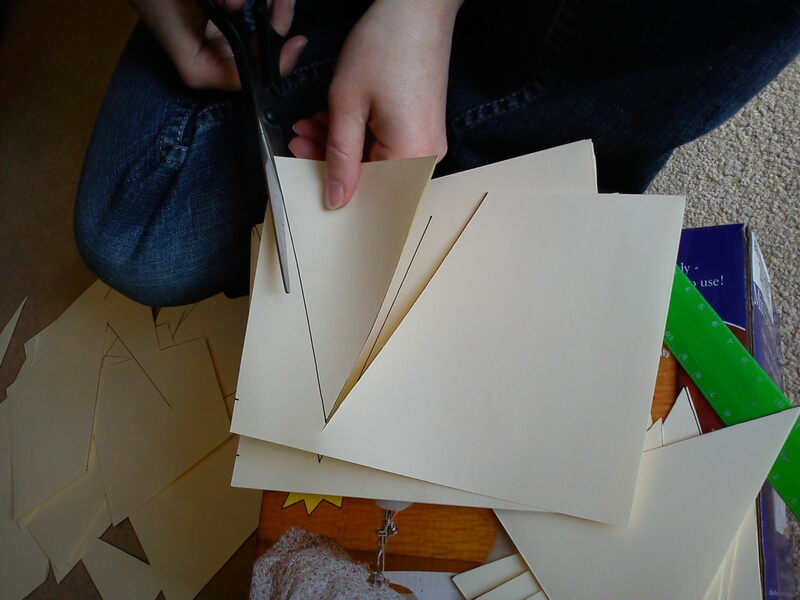 1) You need to create a triangle template out of cardboard to the desired size. With the fabric you have chosen, layer two of the fabrics on top of each other and pin them along the top of the fabrics. 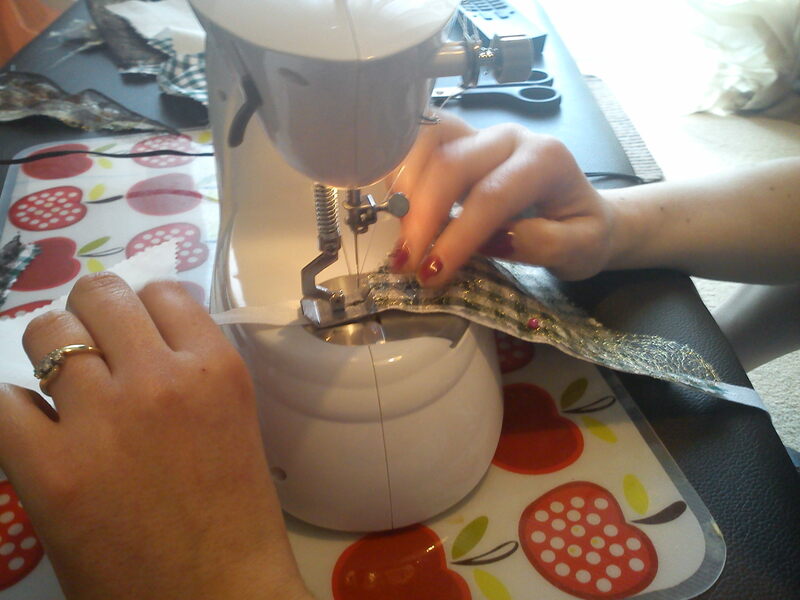 We layered them on top of each other so that it cut down on the labour time of cutting the fabric into the triangles. 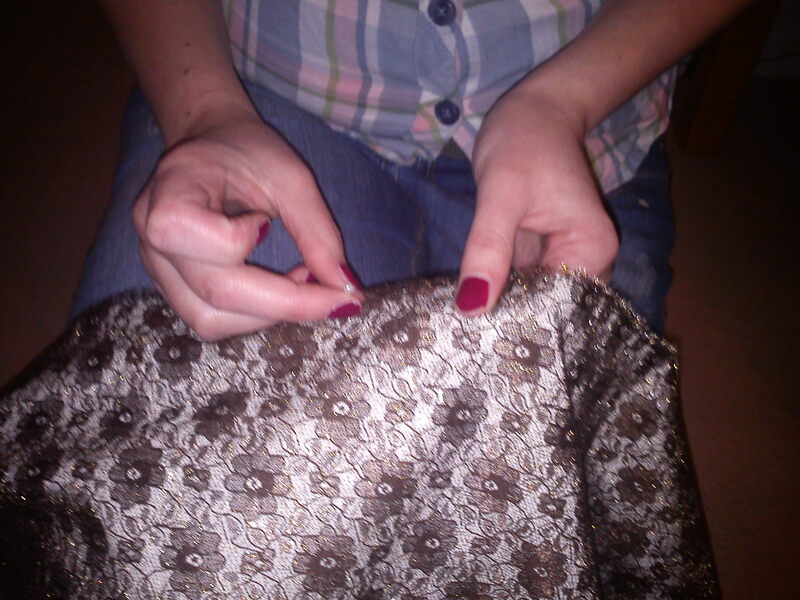 Don’t worry too much about holding the fabric taut when cutting around the triangles. We kept the fabric loose, so that the fabric triangles were slightly bigger than the cardboard template. 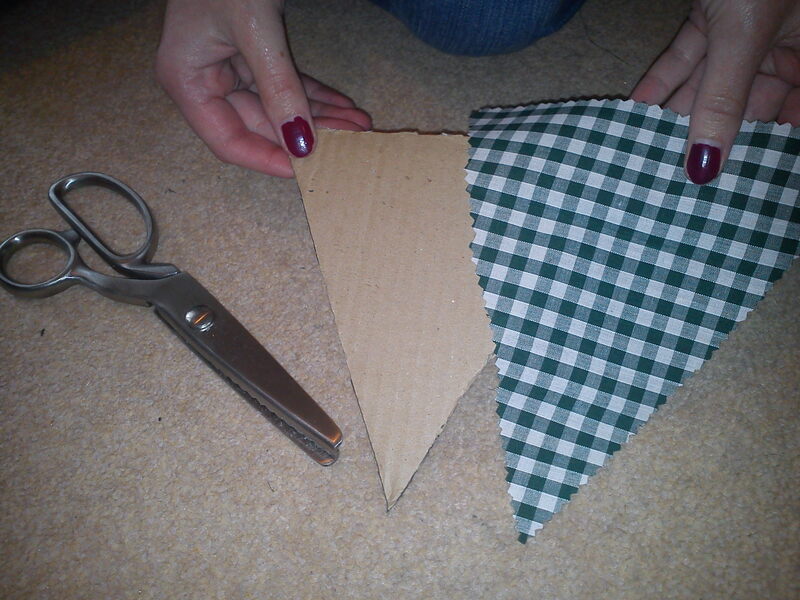 2) Once you have your triangles cut out you may want to choose a pattern for them so that you know how you are going to attach them onto your bunting line. 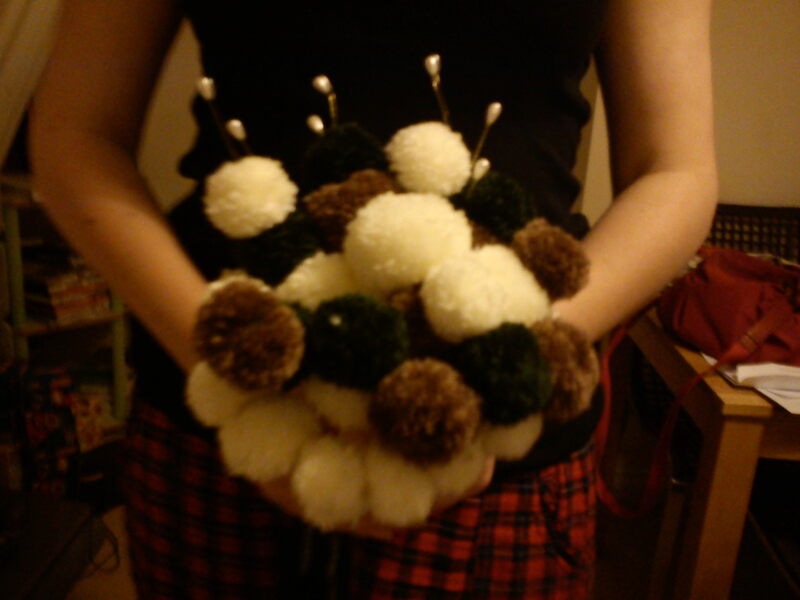 The pattern we went for was; cream & brown, cream, green & gold, cream, green & brown, cream & gold, green etc. This gives you structure to what you are doing. 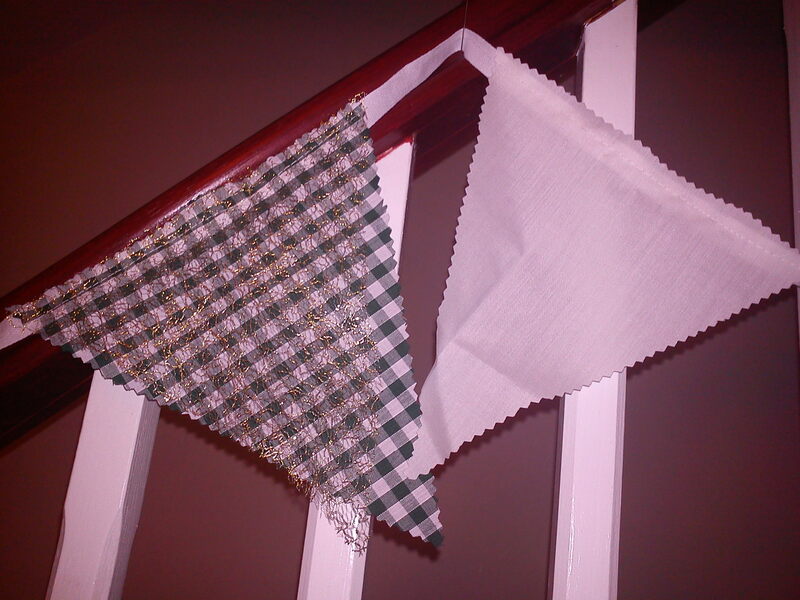 Once you have decided on your pattern you will then want to start pinning the triangles onto the bunting line. 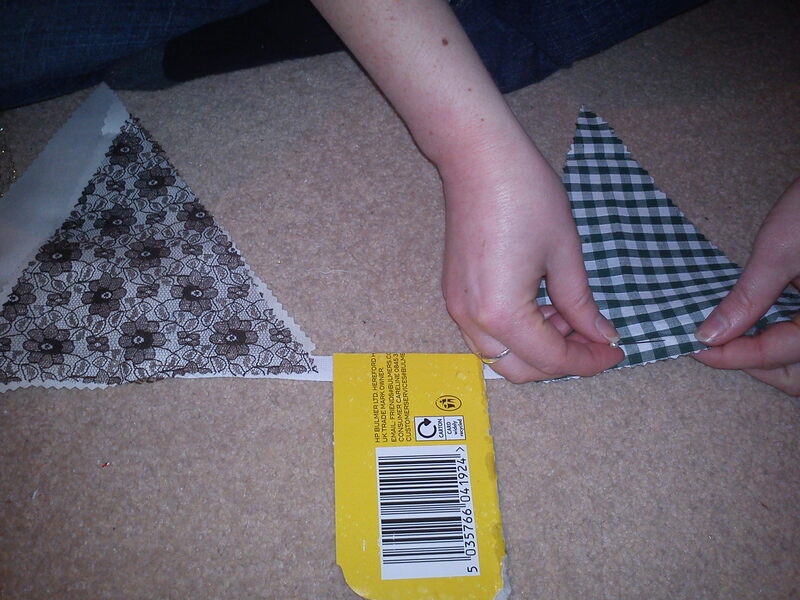 As you pin the triangles onto the bunting line make sure you are evenly spacing the triangles on the line. We used a piece of cardboard to measure the spaces. 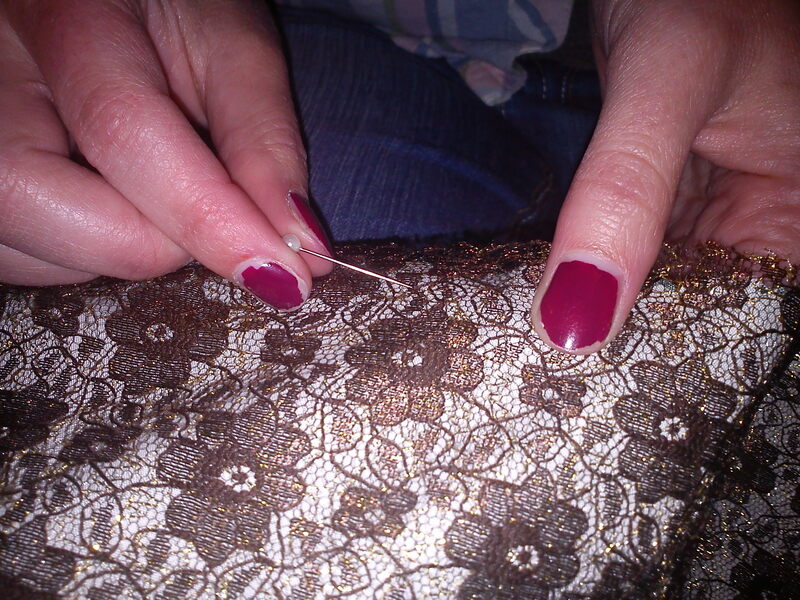 3) Start sowing the triangles of fabric onto the bunting line, removing the pins as you go. I continuously sowed for the duration of three films. Free Willy, Free Willy 2 and Free Willy 3. 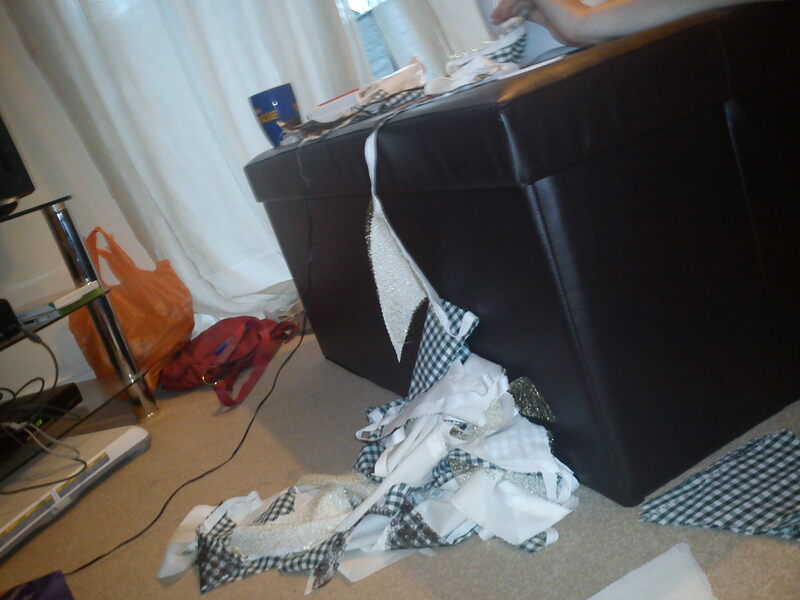 Before I knew it I’d mounted up a fair pile of bunting. Often the season chosen for the wedding affects the wedding colours that the bride and groom choose for their wedding day. Baring in mind the season when choosing your wedding colours is a very good idea, as it can not only make your whole look co-ordinated and in keeping, but it can also make your wedding cheaper.